The Mexican home we will explore today has just the right balance of rustic and contemporary flair. 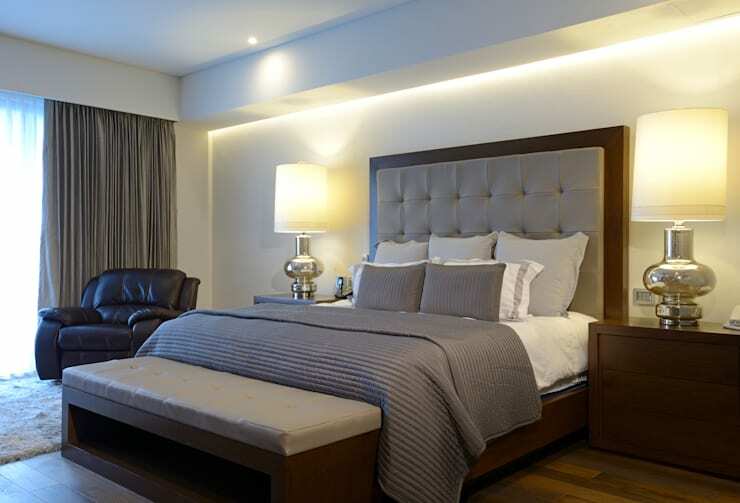 The homely elements make the family abode cosy, while contemporary design brings sophistication and gloss to the mix. The total effect is so cohesive and streamlined that it's easy to overlook the sheer variety of elements on display here. 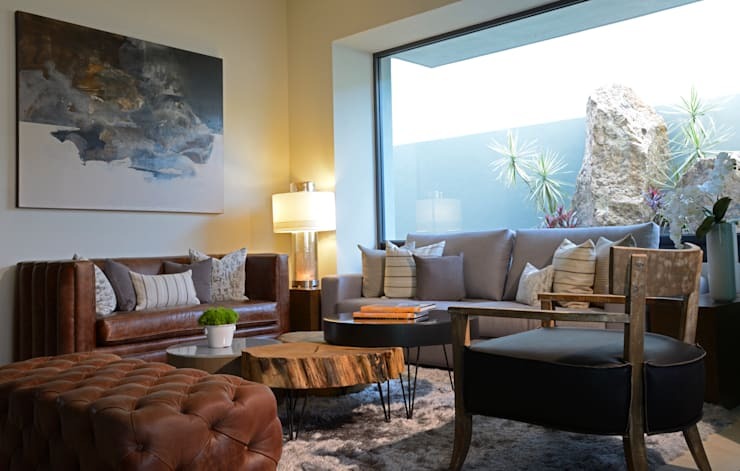 The bright, private living room has a wonderful large window overlooking a very private rock garden feature. This earthy element has been greatly amplified by the interior decorations and furnishings. The interior has been furnished with an earthy palette, and the sofas, armchairs and coffee table have a huge variety of materials and textures. Variety in form is a very common way to create warmth and cosiness in a room. People do tend to prefer contemporary elements over rustic looks in a kitchen. So here, in this combined kitchen and dining room, the smooth gloss of contemporary style definitely reigns supreme. 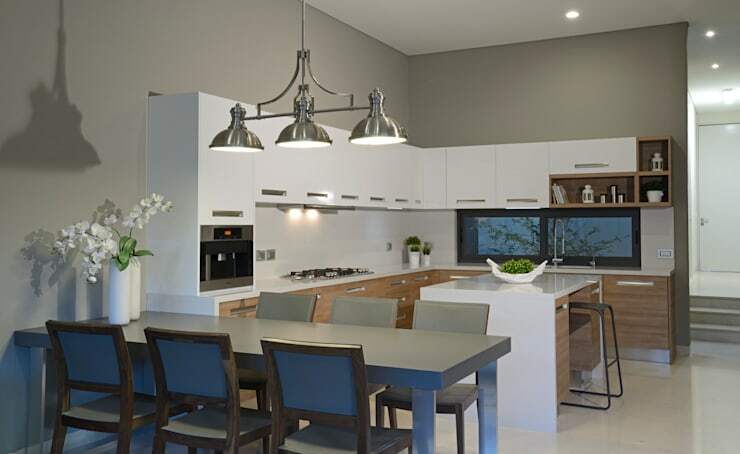 The white kitchen cabinets and unfussy design create a sense of ease and the dining furniture is definitely modern. But the dining table also has a large overhanging light made from iron. 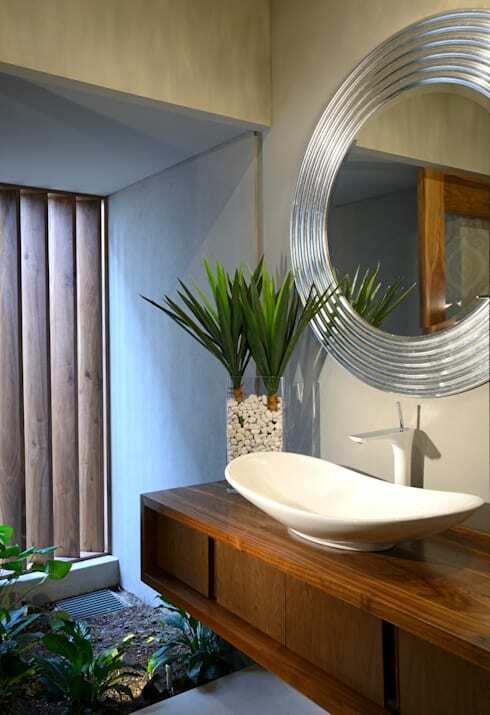 This is a common, earthy element that beautifully straddles rustic and contemporary styles. The silver tones of the light also reflect the grey of the kitchen wall and create a unified effect. The interior decorators have really let loose on the rustic elements in the home bar. 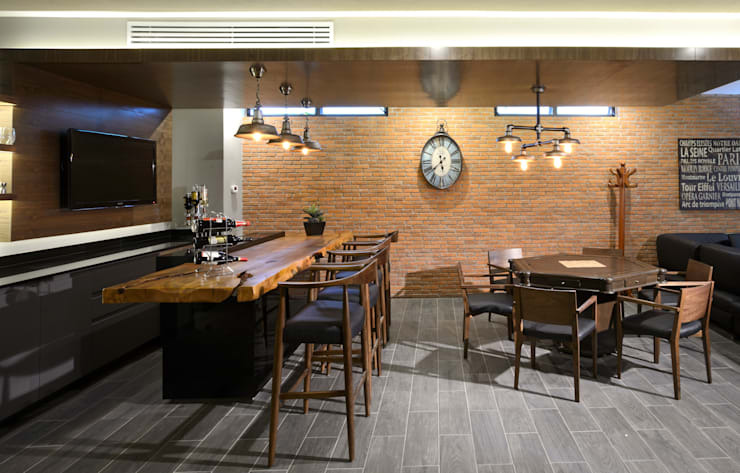 The concrete bricks we saw on the exterior have been used on the floor, the wall is constructed with fine red bricks and the iron pendant lights are a key feature. Note the large roughly-hewn wooden bench bar on the left. Although the distinctive wooden bench has been paired with a super high-gloss counter, the look is cohesive. This is largely due to the cohesive pull of the parallel lines and dark colours. The master bedroom looks as comfortable and understated as a hotel room. The colour scheme is composed of soft greys and gentle earthy tones. The high grey headboard adds a certain sophistication and the oversized bedside lamps give the room an impressive ambience. 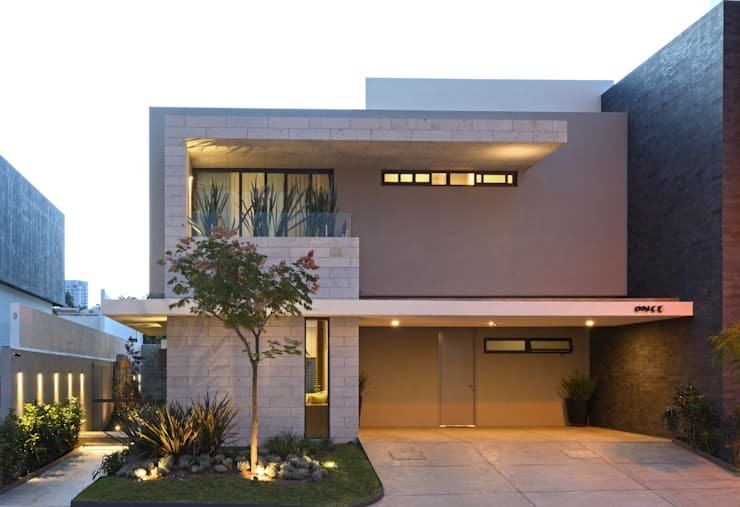 The home has these wonderful portals to the surrounding external green spaces. This creates a magical opportunity that the designers have really seized upon. Here in the guest bathroom, they added bold greenery to both floor and vanity. This really accentuates the link to the outdoor area. The floating wooden panels on the wall also give the room a lot of air flow. To retain this sense of light airiness, the wooden bathroom cabinet has also been raised off the floor. Finally, this is a home with just a hint of flamboyance. So the designers have finished the look with a bold round silver mirror. If you are interested in unusual family-style homes, you'll love: The Hong Kong apartment built for a family. Which is your favourite room in this lovely rustic modern home? Let us know in the comments field below!